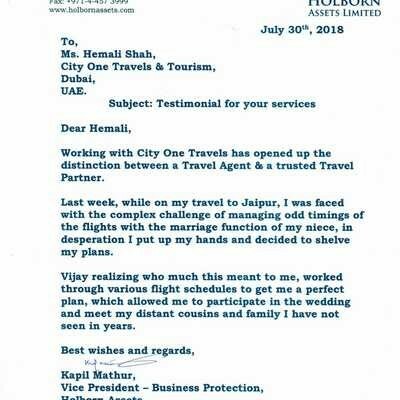 I have been using the services of a travel & tourism company for some time now and never had any complaints. I started referring work to City One Tourism recently and immediately realized that I was missing the value addition from my existing contact. Their service is prompt, professional and value for my money. They have not only matched prices wherever asked but offered better deals instead most of the times. Special requests have mostly been considered and my friends and family have nothing but praises for them. 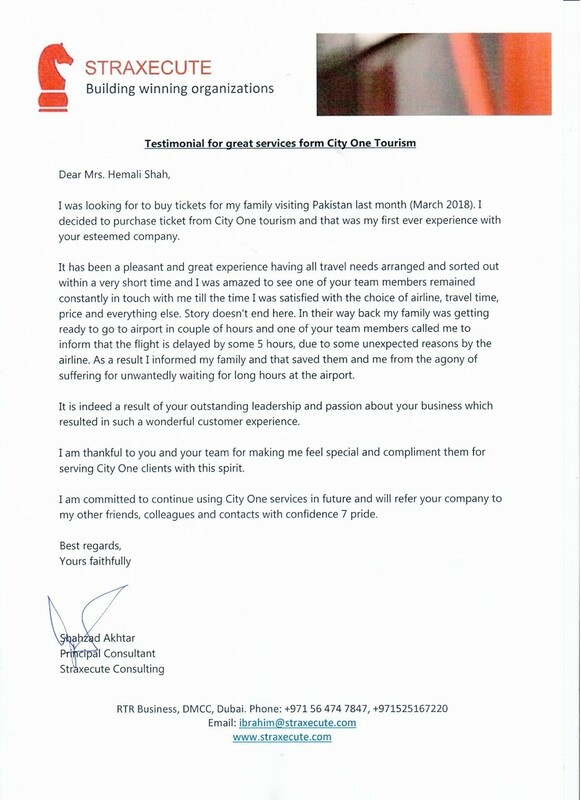 I am writing this testimonial only after using their services more than a few times and have no hesitation in recommending City One Tourism. I wish the best for Punit and the team. 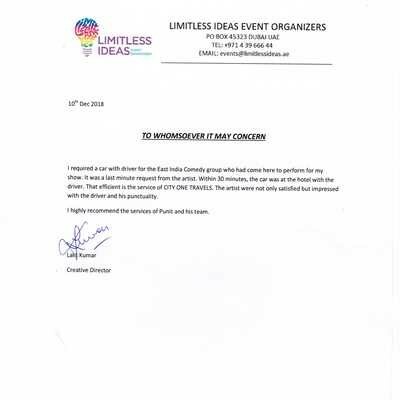 I required a car with driver for the East India Comedy group who had come here to perform for my show. It was last minute request from the artist. Within 30 minutes, the car was at the hotel with the driver. That efficient is the service of CITY ONE TRAVELS. The artist were not only satisfied but impressed with the driver and his punctuality. I highly recommend the services of Punit and his team. 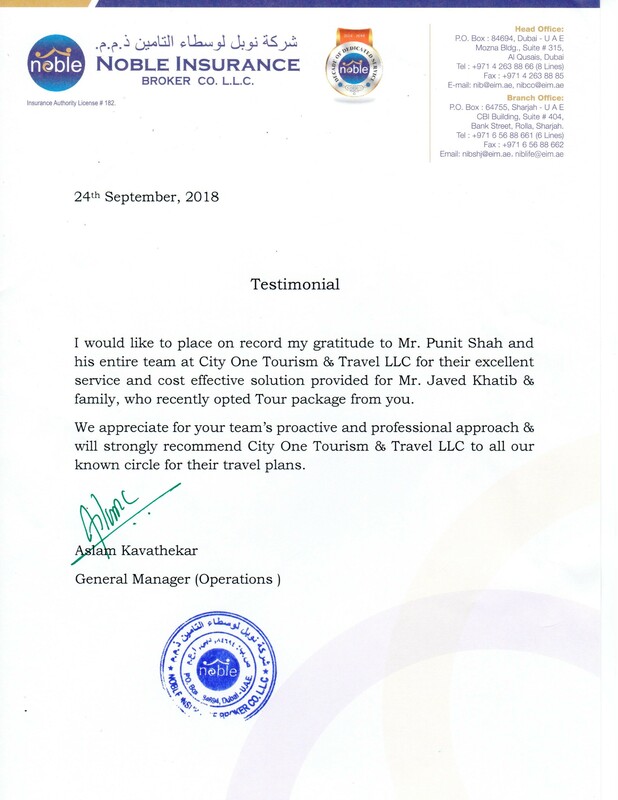 I would like to place on record my gratitude to Mr. Punit Shah and his entire team at City One Tourism & Travel LLC for their excellent service and cost effective solution provided for Mr. Javed Khatib & family, who recently opted Tour package from you. 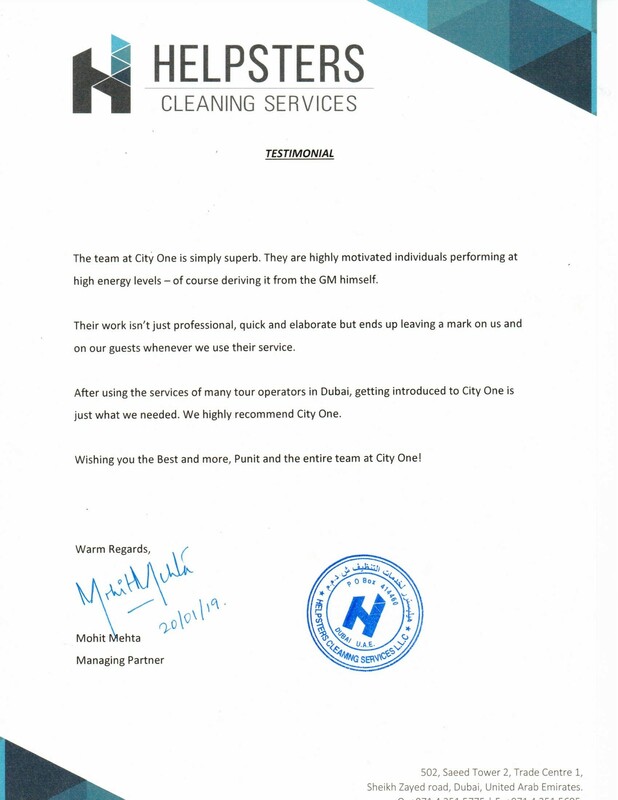 We appreciate for your team's proactive and professional approach & will strongly recommend City One Tourism & Travel LLC to all our known circle for their travel plans. 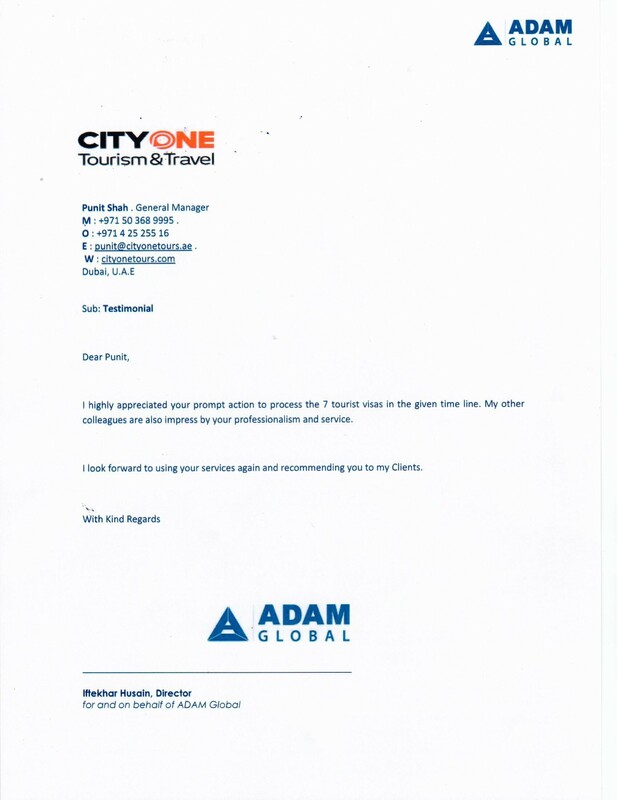 Working with City One Travels has opened up the distinction between a Travel Agent & a trusted Travel Partner. Last week, while on my travel to Jaipur, I was faced with the complex challenge of managing odd timings of the flights with the marriage function of my niece, in desperation I put up my hands and decided to shelve my plans. Vijay realizing who much this meant to me, worked through various flight schedules to get me a perfect plan, which allowed me to participate in the wedding and meet my distant cousins and family I have not seen in years. 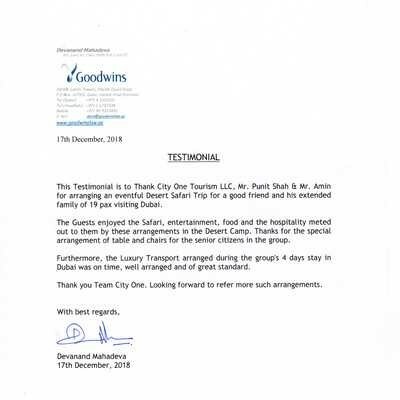 Hemali and her team were on the spot when it came to booking the venues, travel vessels and necessary documentation. 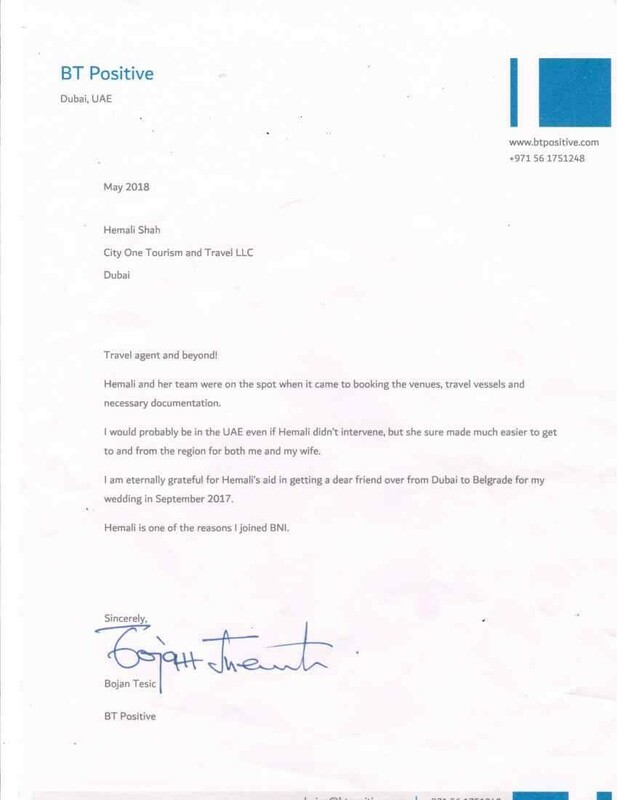 I would probably be in the UAE even if Hemali didn't intervene, but she sure made much easier to get to and from the region for both me and my wife. I am eternally grateful for Hemali's aid in getting a dear friend over from Dubai to Belgrade for my wedding in September 2017. Hemali is one of the reasons I joined BNI. I highly appreciated your prompt action to process the 7 tourist visas in the given time line. My other colleagues are also impress by your professionalism and service. I look forward to using your services again and recommending you to my clients.